For the upgraded visual presentation alone, Ex Machina is a must-have to add to your collection. In addition, the philosophical conversations between the characters bring this movie to a higher level than most simple plots. On the heels of a prior blockbuster movie from 2013, Lionsgate releases Ex Machina (2015), taking us into the world of A.I. like we have never seen or even imagined before. Visual effects galore even impressed the Academy so much that they awarded Ex Machina the Academy Award for Best Visual Effects. Ex Machina is not a formulaic storyline. In fact, the storyline glosses over unnecessary details and goes right to the heart of the more intelligent and in-depth storyline. Obviously, we are dealing with a programmer and an A.I. stored in a beautiful female container, therefore, the dialogue is more intelligent and gets right to the heart of the characters. Domhnall Gleason (About Time) stars as Caleb Smith, the programmer who discovers that he has "won" the opportunity to take part in a study of artificial intelligence. Gleason's performance is unique- he seems to have no surprise when meeting the A.I. and he seems genuinely interested and natural with his interactions with her, but his interactions with his boss, Nathan, seem stilted and almost forced; although that could be planned and Caleb could simply be nervous around his employer. Alicia Vikander (Jason Bourne) plays Ava, the A.I. Vikander's performance is delightfully interesting. She is an A.I. that seems to want to get to know Caleb but, at almost the first opportunity, she warns Caleb about Nathan. Vikander inserts just the right amount of intrigue to make her character not about being an A.I. but about the character who knows all the secrets that you want to know. Oscar Isaac (Star Wars: The Force Awakens) plays Nathan Bateman, Caleb's boss, and the maker of the A.I. He seems to almost be a reclusive type of character, deemed on showing his power in a subtle but a domineering way. Isaac plays his role with a soft seriousness that lets Caleb know who is in charge, who's project this is, and who will make the rules- or so he thinks. Issac's performance seems natural and his movements flow, although his character doesn't seem that realistic. Although the characters seem a bit unrealistic, the performances given by Gleason, Vikander, and Issac work together. As a whole, the plot flows and pieces of the inner story are dropped in as red herrings throughout the first half of the film. Despite that, this is not a movie about the plot or story- but more about the words and interactions between the characters. The visual effects make this movie and bringing into the realm of the 4K Ultra HD presentation was a smart move on Lionsgate's part. Presented in 2160p UHD with an aspect ration of 2.40:1, in 16 x 9 widescreen, it's clear why this movie won an Academy Award. The colors are bright and crisp. Hues are deep and saturated. Black levels are dark and rich. The UHD presentation of Ex Machina is a huge upgrade from the HD Blu-ray and provides the viewers a spectacular cinematographic experience. The audio remains the same as it did on the prior Blu-ray HD release- DTS:X. While Lionsgate has upgraded the audio quality on other 4K releases, for some reason they chose to leave the original HD audio. Despite that decision, there is no fault n the audio quality. Dialogue is crisp and clear and never seems overpowered by the intense and immersive background music. Through the Looking Glass: Making Ex Machina: A 5-part featurette that takes us through the making of the movie- including the storyline, the cast, the characters, all the way through the visual effects, which won an Academy Award. 8 Behind-the-Scenes Vignettes – These vignettes are: Making Ava, Nathan's World, New Consciousness, Becoming Ava, Director, Cast, Meet Ava, God Complex, and Music. SXSW Q&A with Cast and Crew: Recorded in Austin, TX at SXSW on March 15, 2015, this Q&A includes Director/Writer Alex Garland, Actor Oscar Isaac, Director of Photography Rob Hardy, as well as Composers Geoff Barrow and Ben Salisbury. For the upgraded visual presentation alone, this is a must-have to add to your collection. In addition, the philosophical conversations between the characters bring this movie to a higher level than most simple plots. 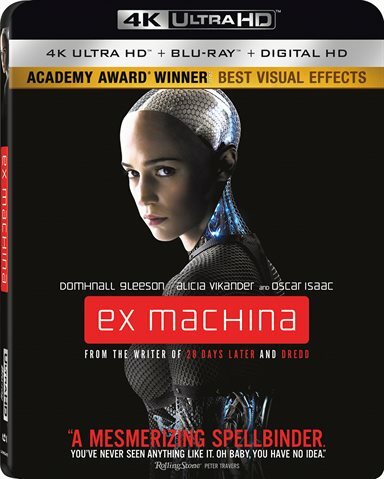 Download Ex Machina from the iTunes Store in Digial HD. For more information about Ex Machina visit the FlickDirect Movie Database.